As always, the Markit Purchasing Managers Indexes are some of the first data we receive about a month. 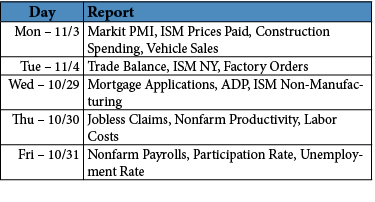 The November preliminary readings came out today and from the perspective of the global business cycle, it is hard to find good news in there. 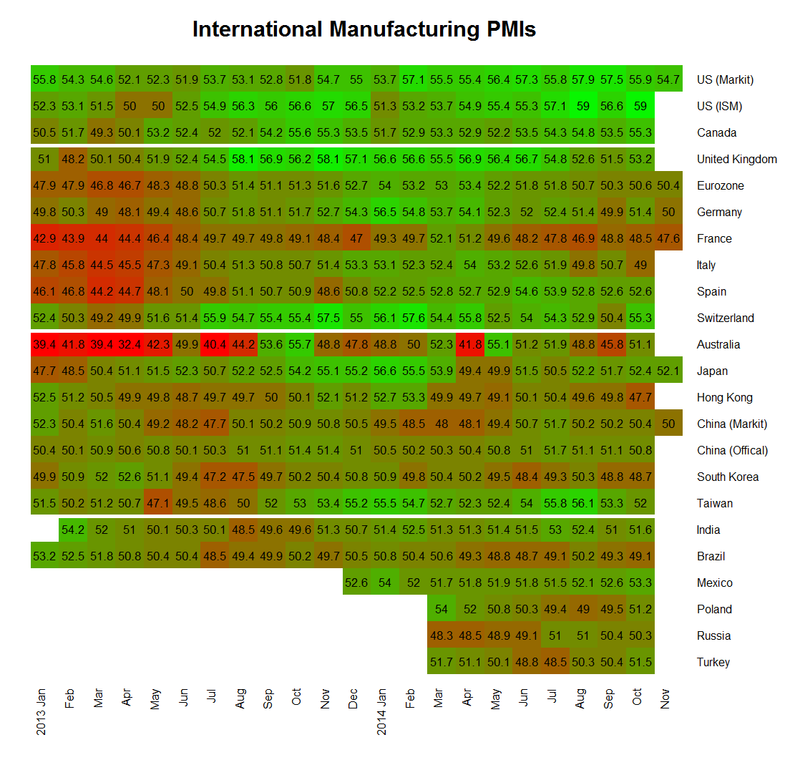 All the PMIs released were lower than their final number for October. The upticks we saw in the Eurozone and China appear to have been reversed. 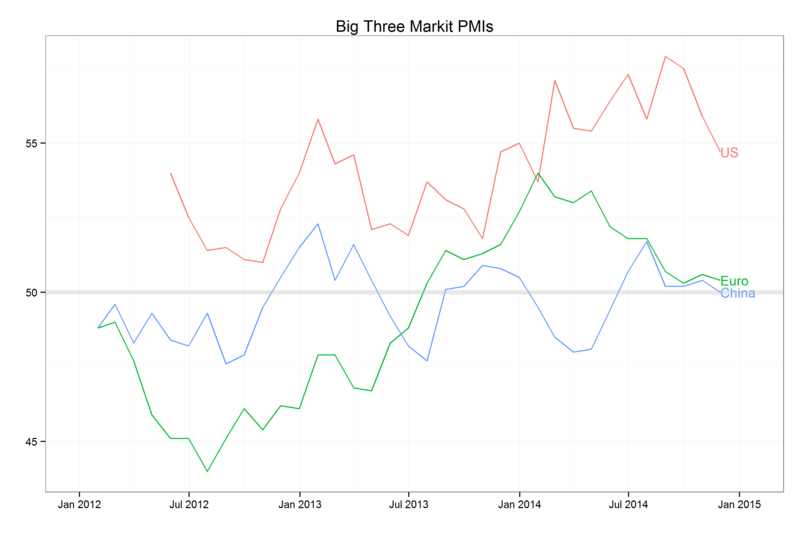 The time series below shows a different view of the big three, US, Eurozone and China. All off their recent highs and the Eurozone and China close to the contraction line. I am concerned we will see additional deterioration in coming months, though there is currently no sign of a dramatic plunge in manufacturing activity. The big decision for the Fed next year will be if they should start raising interest rates. 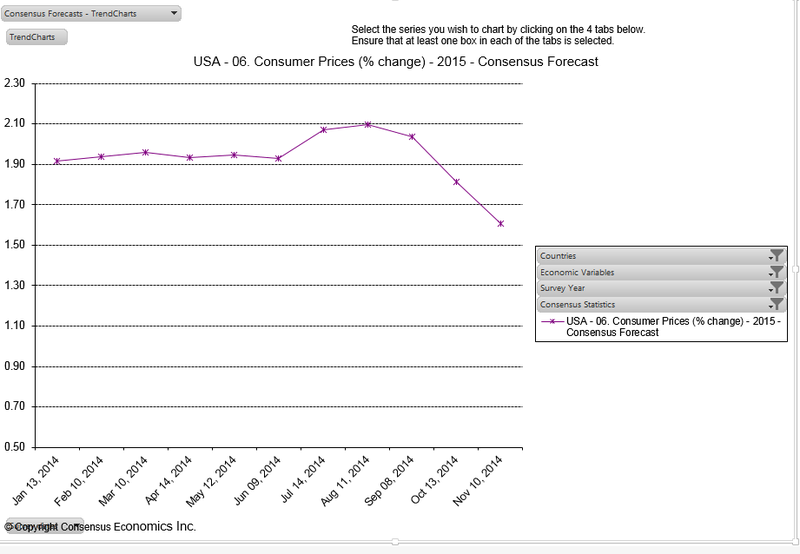 Remember that the fed is charged to try to maintain price stability and full employment. 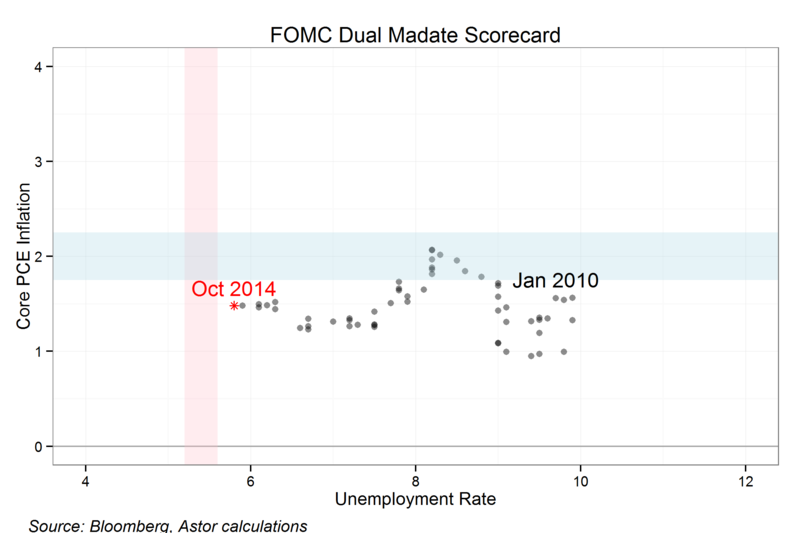 This chart shows unemployment and inflation along with the Fed’s inflation target (in blue) and the unemployment rate consistent with stable prices (in pink). The economy has improved without inflation over the last five years. As the chart below shows, over the last 20 years actual inflation has spent a good deal of time below a band around 2% inflation except and only brief episodes above, suggesting that the Fed is too hawkish on average. There is mounting evidence (for example this note published by the Fed) that the recessions, the possible outcome for raising rates prematurely, can involve permanent reductions in the level of output. Simply put, if you have a million people working for a year they make a certain amount of stuff. If there is a recession and they are out of work, they don’t make up all of the lost output once the economy recovers. To take this risk the threat to price stability must be substantial. Finally, inflation expectations (based on surveys or derived from market prices) remain stable. If he is using this as a reason to raise rates, I cannot agree. First of all, surely a decline in inflation risk premiums means that the market is less concerned about sudden jumps in inflation. That is, the market is telling you that the market is not worried about inflation. I am not sure why a policymaker would want to discount that. 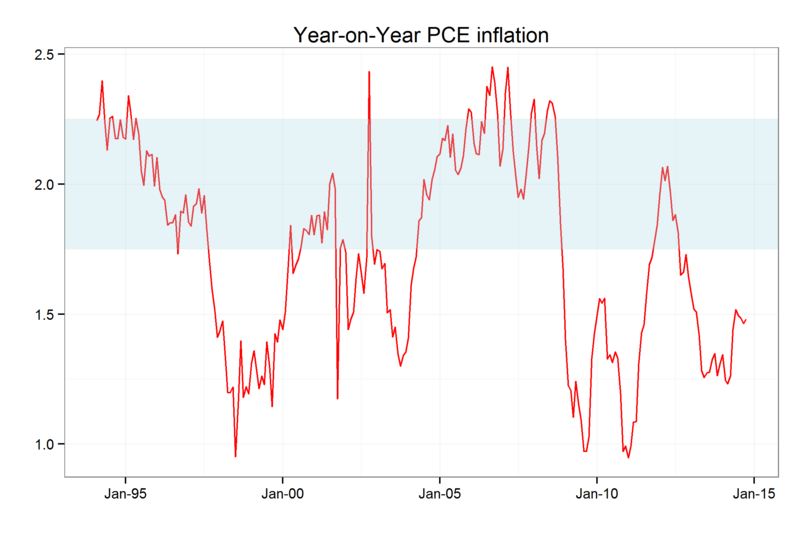 Second, it is not clear that Survey based inflation expectations are indeed stable. See this chart of expectations for next year from the Consensus Economics survey. Whatever is ahead, our next landmark is the final FOMC meeting of 2014 which will feature new forecasts from the committee members and a Janet Yellen press conference on December 17. Hopefully we will get more insight into the Fed’s plans then. In the meantime it is worth noting that for Fed Funds to get to what the median member expects of about 1% by the end of 2015 and they proceed in bite-sized 0.25% steps, they will need to start raising rates in their fifth meeting of the year in July. Given the Fed’s reluctance to surprise the markets, I would expect clear warnings at the March press conference at the latest. Interestingly, the Fed Fund futures seem to expect less easing overall with year-end 2015 rates in the market at 0.5% which implies starting later or not raising rates at every meeting after they start.